Eight NACK Members and a couple of friends met up with the Yonkers Paddling and Rowing Club on Saturday 7/16/2011 for their Kayak Around Manhattan event. 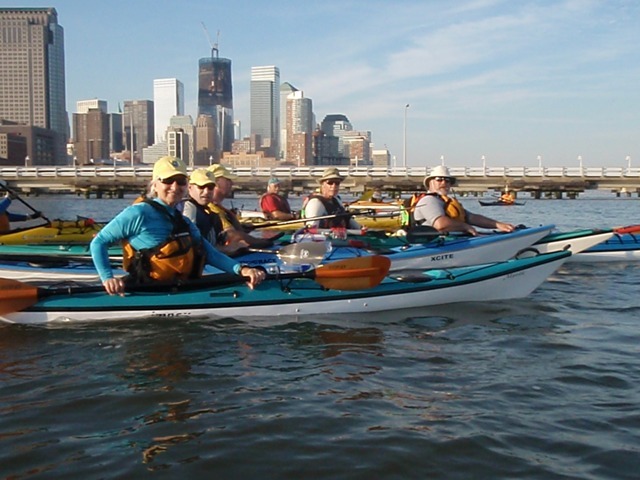 The Manhattan Island kayak circumnavigation began at Pier 40 (Houston Street) and launched from the Downtown Boathouse floating dock. 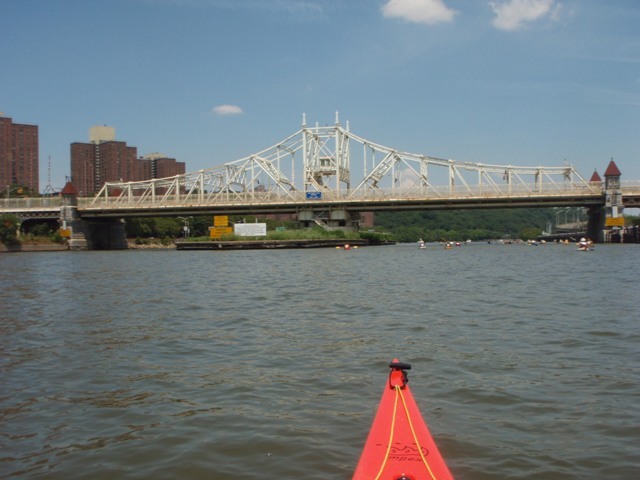 Circumnavigating Manhattan in a kayak is a tricky 30 mile trip that requires careful planning and timing to make the most of the strong currents and avoid getting caught paddling against the flow. As we got underway the Manhattan skyline was stunning in the early morning sun. In short order the Statue of Liberty was visible on our right as we approached the Staten Island Ferry terminal. There’s plenty of big commercial boat traffic and pleasure craft in the area so it’s essential that the group stay well organized. Carefully coordinating the crossing of the Battery on VHF radios we made it to the Brooklyn side of the East River and the magnificent Brooklyn Bridge. Perhaps the most critical part of the trip is passing thru the Hell Gate confluence of the East River, Harlem River and Long Island Sound. With the full moon the day before, currents in the vicinity were running up to six knots. Paddling up the East side of Roosevelt Island we were traveling at 10 MPH on the GPS and we sought shelter in Hallet’s Cove to await the slack at Hell Gate. After about an hour layover we made a quick dash past Mill Rock and across Hell Gate to the Harlem river. There’s only a brief window of opportunity to get it done before the East River begins to flow south and the Harlem River flows north as water rushes in from Long Island Sound. Our trip up the Harlem River took us past the old landmark Macombs Dam Bridge and Yankee Stadium. The second scheduled stop was the Peter Jay Sharpe boathouse in Swindlers Cove on the Harlem River. It’s an absolutely beautiful location; hard to imagine that you’re in the heart of the city. After a quick lunch we again headed north with the current on the Harlem River, past Columbia Rock to where the river meets the Hudson. This is another “interesting” location where the north flow of the Harlem River meets the south flow of the Hudson. However passing by the swing bridge at Spyten Dyvil was uneventful in spite of the somewhat confused water. Heading down the Hudson, passing under the George Washington Bridge, we again took advantage of the strong current in mid river. The GPS read over 6 MPH most of the way while we paddled at a fairly leisurely pace. Approaching Grant’s Tomb however, the wind that had turned to the south and building began to work against the tidal flow of the Hudson. In a classic wind-against-tide situation swells quickly grew to 2 to 3 feet and were closely spaced. By mid afternoon the NOAA Weather Station at Robbins Reef, directly to our south, was reporting wind SSW at 15 to 17 knots. Since it was blowing directly up river, there was almost 17 miles of open water for that wind to try to push water back up the Hudson. The river, flowing at about 3 knots, of course refused to be held back and treated us to a pretty good roller coaster ride. The group hung together and then took a brief rest at Pier 96 while a big cruise ship departed. Then, rested and refreshed, we continued three more miles back to Pier 40 where, at 5 PM, a tired group of paddlers congratulated one another on their accomplishment. The kayak circumnavigation of Manhattan Island is certainly a trip that one will long remember. Many thanks to the YPRC, Steve Blumling, Jerry Blackstone and all the fellow paddlers for a safe and enjoyable day. Lots more photos Click Here with special thanks to David Gottleib, Dara Fee, and John Weickert for their photos. Please send me contact information, I would love to join the 2012 kayak around Manhattan. Please send me contact information for Steve Blumling and Jerry Blackstone. 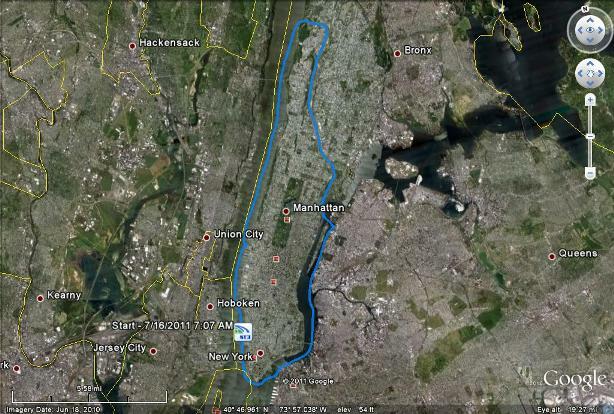 I would like to participate on a paddle around Manhattan in 2012.